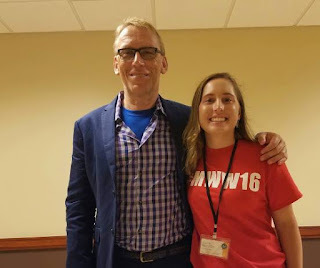 Another Midwest Writers Workshop has come and gone, but this year I had the opportunity to work behind the scenes. Last year I was just a participant, but this year I was an assistant (and intern) at MWW16. I had the pleasure of being the assistant to Uwe Stender, who was not only an agent, but he was also the founder of Triada US Literary Agency. I will admit I was nervous about meeting him. Even though I heard he was a friendly guy, I still didn’t know how he would act when he was actually here. I was glad I met him before the conference at the pizza party at Greeks in the Village. Unfortunately, I couldn’t stay too long. I had to go back to my dorm to help my parents get most of the stuff out of my dorm to move back home for the rest of the summer. Also, I got to have breakfast with him the next morning. At breakfast I got to know Uwe better by asking him questions about publishing and about being an agent. During the conference I was glad Uwe was an easygoing guy and likes to go with the flow. He wanted to make things easy for me, which was nice of him, but at the same time I wanted to do the same for him. I made sure the pitches ran smoothly and were on time. There were some no shows, but it just gave me some more time to talk to Uwe. It was nice to talk to him between pitch sessions. I told him about one of my stories and he seemed interested in it! I also asked him if he would be interested in the first couple rough chapters and he said yes! I started working on it and I will hopefully be finished writing the chapters soon. The second day of the conference the pitches ran smoothly, but not the class Uwe was teaching. I thought they would be bringing a laptop down so he could present his PowerPoint, but I was wrong. We improvised and used my laptop, but again there were problems. Next thing we knew we discovered that the plug we had was not for a Mac, so while Uwe started presenting I had to run down and ask for a converter. After we got the converter there was even more problems because I had to figure out how to do a dual screen so we could see the PowerPoint. With some help we thankfully got the PowerPoint up and I changed the slides while he was presenting. He was very appreciative of my help. Unfortunately, he couldn’t stay for the banquet that night. We said our goodbyes and I hope to keep in contact with him. I had learned many things from him while I was assisting, but I also learned a lot of things that could help people if they want to come to a workshop and want to pitch to an agent. Here are three tips for people that want to pitch at a writing conference/workshop. Seriously, all of the assistants (including me) kept constantly changing and rearranging the schedules trying to fit people in. Between the six of us there were multiple no shows. We concluded the no shows happened because people didn’t check their schedules. I was lucky that we stayed in the room a little bit longer than normal for one of the pitches because he was able to do his pitch (he was to be there at 4:00pm and he showed up at 4:05pm). My band director always said that if you are on time, you are late and if you are early, you are on time. I would suggest following this rule.When I assisted with pitches,I was more generous than most. I gave people the benefit of the doubt and waited for them for a bit. If they didn’t show up by the time their pitch session ended I just moved to the next person. Depending on the intern they could possibly just skip you if you were not there and moved on to the next person. There were multiple people pitching books to my agent that were not the type he was looking for. He usually gave them a lead to other agents that would be may be interested in the book. This was one of the most common complaints of the agents. Always research your agent before you make a pitch session so you do not waste neither his time nor yours. I also have 3 tips for other interns that are helping out at the conference. My first day at the conference we were told to dress up because we were going to be presented at the opening ceremony and I made the poor choice of wearing new shoes. When you are an intern you have to walk around a lot and you definately don’t want blisters to form that you have to deal with for the rest of the day. Even if you have to dress a little nicer don’t wear shoes you haven’t broken in. If you are like me and were assisting an agent do not be afraid to ask them questions. My agent was always happy when I asked him a question because he wanted to help me as much as I was helping him. They aren’t going to be upset and the same goes with any presenters that are at the conference. The reason they are there is because they want to help writers get better and asking questions is a perfect way to help you. Being an intern is hard work, but at the same time very rewarding. So make sure to have fun and enjoy this experience because it will go faster than you think it will. 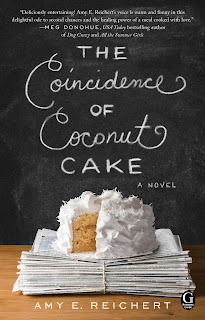 Amy E. Reichert, author of The Coincidence of Coconut Cake, along with her recently July 12 release of her second novel, Luck, Love & Lemon Pie, loves to write stories that end well with characters you’d invite to dinner. 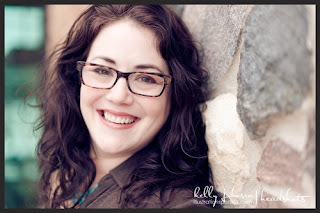 Amy is a wife, mom, amateur chef, Fix-It Mistress, and cider enthusiast. She has also earned her MA in English Literature and serves on her local library’s board of directors. Amy and Karma Brown are co-teaching the Part I intensive session Women’s Fiction, Deconstructed at the 2016 Midwest Writers Workshop. MWW: The Coincidence of Coconut Cake was your first book, were there some unexpected challenges you had to face during the publishing process? AER: CAKE was my first novel, so I was teaching myself how to do that. It was definitely a case of a didn’t know what I didn’t know. As a result, I started querying agents way before the manuscript was truly ready. I racked up a lot of rejections, but I made a lot of friends and learned so much about the industry. Plus, that thick skin helps because rejection is a permanent part of a creative lifestyle. MWW: Why did you set this book in your home town? AER: I love Milwaukee and I wanted to share that love with the world. We have so many exciting restaurants, festivals, and sporting events. The people are kind, the weather is varied, and the deep-fried cheese curds are the best. MWW: Is there any restaurant in the book that you based off a restaurant you actually been to? AER: There are a few restaurants that are real, like Northpoint Custard, but Luella’s, A Simple Twist, and The Good Land are all figments of my imagination. Luella’s isn’t, but I envision the other two being very similar to some of my favorite farm to table restaurants in Milwaukee like La Merenda, Wolf Peach, and Braise. I love restaurants that rotate their menus based on available ingredients. MWW: In both of your books, your main focus are on relationships. Are some of these relationships based off of experiences in your own life? AER: Not really, but a little bit yes. Everything is fictional, but I have plenty of close friends and a husband, so I was able to use that as a starting point for some of my characters’ relationships. MWW: Describe for me your perfect meal and who would you like to share it with? AER: Both my grandmothers are deceased, but they were both amazing cooks. The perfect meal would be one prepared by both of them and would be with all my grandparents, my husband’s grandparents, his dad, and all our living family. It’s probably not fair to bring back my grandmas from the dead to cook for so many people, but I’d love to learn a few of their tricks. It would be an epic feast! Warning: Do not read on an empty stomach. 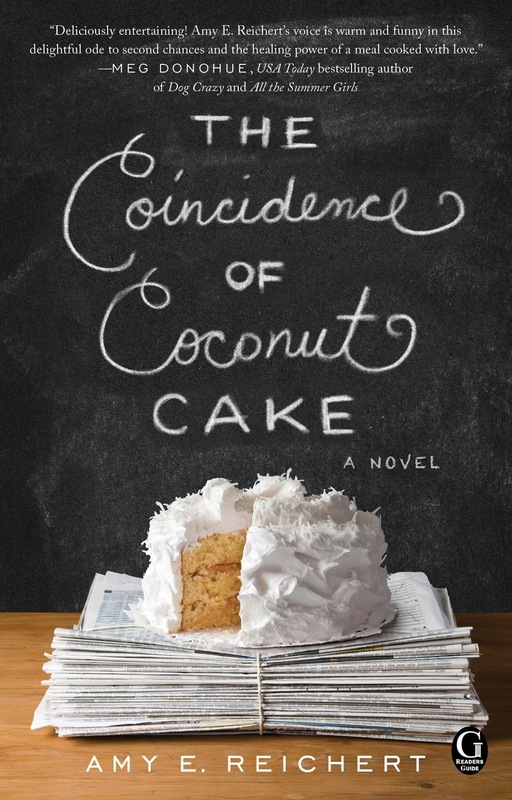 Amy E. Reichert’s debut novel The Coincidence of Coconut Cake not only contains descriptions of food that makes you want to taste them yourself, but is also a delicious meal containing perfect servings of humor, romance and drama. Lou is the owner of a small French restaurant in Milwaukee, Wisconsin. Lou is living the dream, owning her own kitchen, despite the conflicts with her fiancés plans. Her dream is shattered when she decided to surprise him on his birthday with a coconut cake, only to find him with a half naked intern. She tried to get her mind off the betrayal by working, but ended up only making the worst dish she had ever made (unknowingly) for the snarky new restaurant critic in town. When Lou goes to a bar to wallow in the sorrow of her broken relationship, she meets Al, a British newcomer. After some drunken flirtation she promises him to show him the best of Milwaukee. After a series of non-dates around Milwaukee, Al falls in love with Lou and the city, only to find out her true identity and to discover his review of her restaurant had ruined her business while also crushing her dreams. Amy Reichert’s own experience in the kitchen served her well when writing this novel. She gives a look at what happens backstage in the kitchen, while also showing the different kinds of people that work there. Her many descriptions of food making making readers want to try the dishes she described. I do like the pace in the book because it shows a realistic sense of dating and falling in love. The plot was well written, with two plot lines being mixed into one, one plot about romance, the other about Lou trying to save her restaurant. The story keeps you interested in the plot while leading up to the climax. Reichert wraps up the ending quickly with a glimmer of hope, which works well for this book. The novel focuses on building their relationship, until they finally realize they were truly in love. When we think of the word fail, we associate it with a lot of negative thoughts along with things that you can’t do now because you fail. We made a mistake and paid the price, but coming from own experience, failing can be a learning experience. I will be honest, when I realized how much I failed on my book, it at first it felt like I fall down into a bottomless pit that no one can get out of, but then I come to realize that this isn’t true. There is always a bottom to a pit and always a way out. I basically fell for all 4 of Jane Friedman’s “The Traps Beginners Fall Into” from her book “Publishing 101: A First-Time Author’s Guide to Getting Published, Marketing and Promoting your book, and building a Successful Career” (a book that I would highly recommend!). It wasn’t really that I didn’t want to wait for agent or deal it was just at the time that I couldn’t due to my circumstance and age. I started my first manuscript in 7th grade when at the beginning was just a way to pass time, but grew into a passion for writing. For the next four years I worked on the novel and eventually had my first draft. After that I had my dad help me edit my book. I was only around seventeen at the time when I finally self published my first book. I was still in high school and most people that published were mainly adults. I came into a mindset that I couldn’t properly try to publish my book because agents wouldn’t take me seriously and the only option I had been to self publish. I defiantly cut a lot of corners when making my book, this one was one of the biggest things I now regret not doing. The main reason why I didn’t get one is because of the cost. They may have been supportive of me writing, but didn’t think I needed to shell out lots of money to pay for an editor. My dad said he could do it for free and though I knew my dad would be correct all the grammar, he did not know anything about making a good story into a great one. He was a good sounding board where I could bounce off ideas with him, but he was nowhere close to the editor I really needed. May be then I would really saw how much this book really needed before actually putting it out there. I was so embarrassed on how bad it was when I took a second look at it after those two years. Of course younger me at the time thought it was perfect, but now after gaining more experience I was thoroughly wrong. Did I think my book was unique? Yes. Did I think it deserved a chance to be published? Also yes. Did I do it the right way? Defiantly no. It is a moment of realizing this is when you really wish time travel was possible, so you can just go back and slap your younger self. Though I have to give myself some credit, back then I thought I was doing all the right things. That things will just happen if I just do what my parents say and get my book out there. I mean they were always right before. The thing is though, parents aren’t always right. They will have the best intentions, but that doesn’t mean they know everything like we tend to believe (I know shocking). Mine sure weren’t, my dad is a lawyer and mom an elementary teacher. Sure they know a lot in their respective fields, but they never wrote a book, nor have they have any experience in the publishing industry. Heck though, I didn’t either, but that is probably the reason why I followed their advice so much, because I for the most part had no idea what I was getting into. It made me wish they taught a publishing class in high school. So what have I learned? I learned that life doesn’t give you stuff on a silver platter and even when you think you conquered that mountain sometimes it turns out you just fallen into a deep hole. A pit filled with insecurities, hopelessness and monsters, but let me tell you that falling down into that scary pit isn’t that bad. For me it has given me time to reflect, backtrack and re-plan what are my next steps in my writing career. Starting with taking my book off so I could re-write the manuscript. So I can make this the best manuscript I could possibly make. I know that I made mistakes, but I was young, I was hopeful and determined. Not to say there aren’t good traits, but at the same time they can lead to bad decisions if focused on the wrong thing. All writers wish to become the next James Patterson, J.K. Rowling or Stephen King, but you can’t let fantasy take over entirely because that leads to tons of mistakes. If anything please take away that. So if you are a first time writer and were in a situation similar to mine, I will tell you that there is still hope! So instead of thinking of this as a pit, see it as a cavern that you haven’t explored yet. You may become confused, but that is ok! 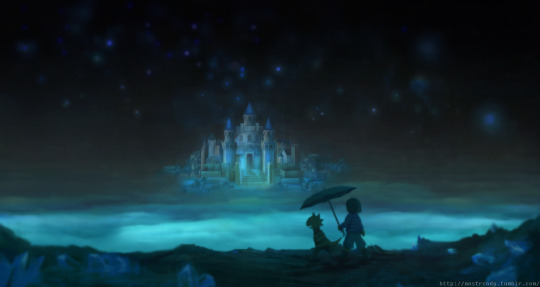 Everyone is at one point confused, so may be talk to the monsters and realize not all of them are bad. You may have a long journey ahead of you, but again that is ok, at least you learned from this and are willing to try again and do it right. Who am I online? A question that hasn’t really been brought to my attention till now. Of course my parents always warn me “Be Careful what you put online!”, but I always was careful. Though, I am cautious about posting some things, other things I post without a second thought. There are really two big differences in who I am, which are professional and casual. Of course that would describe most people. A lot of people (including me) now see Facebook as more as a professional way to look at a person. Especially when a lot of job markets now look at their Facebook as a part of the application process. This has cause me to think of my Facebook differently now than when I was a kid. This wasn’t a place to not just play games and post funny posts, but as a way to show off yourself and let employers see you are a respectable person. This could go for Twitter also, but in a different sense. My Twitter is more professional with a slice of casual since I use my Twitter as apart of my writing career, though I don’t post on it as often because I feel like I don’t have much to say. This causes me to reblog a lot of things from other people rather than make original posts. Along with wanting to keep up with other writers, artists and agents that I like. My casual presence online is anonymous sticking to a username on Tumblr and posting all the casual things I wouldn’t post on my other sites. This includes funny memes, videos, and pictures. All from my favorite shows, videogames, etc. that I am into. It is definitely more the true me than it is the other places because I feel like I can express more since I am anonymous. Though I do have a professional side blog, it is similar to my Twitter where I keep it mainly professional, but also like sharing different interests that I like. So who am I online? Well professionally I am a inspiring teacher and writer going to Ball Ball State to get my degree. Having come from a middle class family that likes to camp, bike and be together. While casually I am a fandom fangirl that likes a bit of everything and likes to rant about different theories and thoughts on my favorite shows. In the end though, if you really like to get to know me just talk to me.